Posted on January 3, 2017 at 10:37 am. 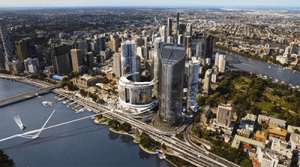 It’s a new year and the development of Brisbane’s $3 billion Queens Wharf casino resort has commenced with unlimited gambling set to be offered. Artist’s impression of the $3B Destination Brisbane Consortium project. Following the winning bid by Star Entertainment Group and its partners to build the Destination Brisbane Consortium it has been revealed the multibillion casino will be able to offer uncapped dealer-run or electronic tables. The entire venture isn’t set to be finished until 2024, with the casino set to open in 2022, but Australian Churches Gambling Taskforce chairman, Tim Costello, has already lashed out branding the electronic versions just as addictive as pokies. “Like pokies, these are the crack cocaine of gambling,” he said. A spokesman for The Star has said these tables weren’t similar due to their format. “The electronic versions are significantly different to pokies in that they are multi-terminal and allow for more than one player to participate in traditional table games, roulette as an example, simultaneously,” he said. A section of William Street was closed on Sunday and will remain this way for 12 months as work on demolishing the buildings commences. Three government buildings will be demolished to make way not just for the casino but for five international hotels, 50 cafes and restaurants, three apartment towers and a huge retail complex over 9.4 hectares. The Star’s Treasury Casino will be moved into the new integrated resort development, while the building will be redeveloped to house The Ritz-Carlton and high-end retail outlets. Star Entertainment has a 99-year contract with fellow operators Hong-Kong based Chow Tai Fook and the Far East Consortium, and it is predicted the casino will offer at least $800 million in gambling taxes to the Queensland government within the first 10 years. State Development Queensland Minister, Anthony Lynham, said the construction will create 2000 jobs, with 8000 positions made available once completed. “Every city has an iconic landmark that people look at, you can imagine people visiting Brisbane, standing out there at South Bank looking at this magnificent structure from South Bank,” he said. Project director Simon Crooks said it was an “exciting time” for the already popular city of Brisbane, but some residents may be disrupted due to buildings being demolished brick by brick. “This will be a slow demolition process,” he said. The Queens Wharf casino resort definitely has the right idea upping the maximum betting limit at electronic gaming terminals, but why bother waiting when you can go online and play higher quality online slots and table games on your phone or tablet? If you are a high-stakes player from United States, you can get uncapped betting limits on table games and slots at Raging Bull Casino, along with a slew of welcome bonuses upon sign-up to kickstart your new account.